It is this very diversity that this conference aims to study. It seeks to deconstruct, for a better understanding and comprehension, the big concepts used by historians. Shall we speak about the civil war or about civil wars (as does J. Smele)? What is this “war?” Is it a sum of several conflicts? What are the groups usually referred to as “Reds,” “Whites,” “Anarchists,” “Nationalists” etc.? How can we define these actors? What are their practices? Thanks to new archival sources which have been made available, we seek to work at different levels of analysis. The first approach is a vertical one: we need to think about the role of leaders and rulers but also simple soldiers and activists. These categories can and must also be geographical: local studies, at a micro level, will be welcomed. The vastness of the post-imperial space presumes multiple situations, each of whom merits to be studied and compared in order to avoid the unified narrative that the participants tried to put forward, especially after the events. We also need to readdress the concepts of centre and periphery, thinking about the structuring of this space. At a micro-level, the individual had to react to the conflict depending on his/her social determinants (class, gender, nationality…). The sociology of contemporary civil wars might help us to analyse personal trajectories, to understand how people got involved in the conflict or refused to take part in it, tried to adapt themselves and to survive. It may also help to understand how people suffered from social, ethnic, gender assignments or how the Civil War represented a turning point in the life of certain people and could even create opportunities for social promotion. 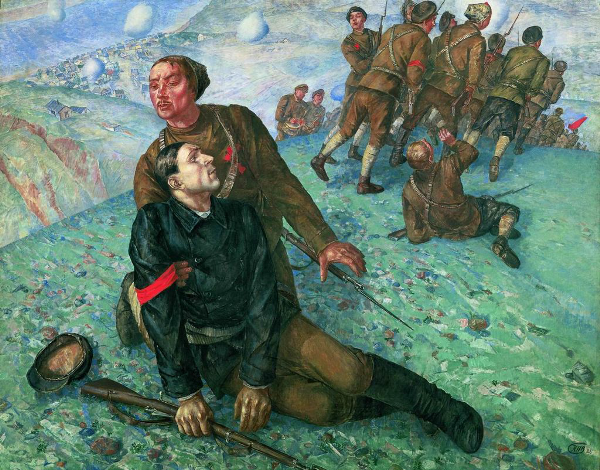 The question of violence — sparked by revolution and counter-revolution — was at the centre of scholarly attention after the “end of communism” and focused on institutional coercion. It is now understood in a more plural form (including rapes, pogroms…) and placed in a broader post-World War I context. This approach allows us to compare the situation in the former Tsarist Empire with other countries in order to investigate interactions and interferences between countries and to point out similarities and specificities. Different chronological frames could also be useful to understand the Civil war in depth. Analysis might be centered on the events or include a larger period. The conflict can be traced in its enduring representations in images, sounds, and objects, and in individual behaviours and in social relationships. It was a “formative experience” (Sheila Fitzpatrick) not only for the Soviet regime and its actors but also for the society and contributed for a long time to give shape to their interaction and practices. These years of deprivation, arbitrariness and violence caused traumas that individuals, families, social groups and institutions have had to overcome by producing various narratives, but sometimes just by forgetting or trying to forget the tragic events. The Civil war was a political moment. There were multitude attempts at creating institutions or States such as in Ukraine or in Russia. Contributions could examine the practices of State-Building, as well as the creations of new political or military systems… The involvement of individuals in these processes can also be studied. We would also like to study the national or supranational character of these institutions as the Bolshevik Revolution claimed both internationalism and the right to national selfdetermination. Contributions could examine how the civil war was waged in the most material meaning of the word. Extreme violence of the war should be studied more precisely through its practices and manifestations. What were the objects of the civil war? The weapons? What was a fighter’s life like? How did people face the challenges of trying to live hunger and disease? We welcome contributions on the fronts of the civil war: how were they organized? What form did they take? How were the spaces of the civil war dominated? How were cities and villages taken during the civil war? Was the countryside under control and by whom? How did information, orders and plans circulate? Health care in the civil war may also be a topic of interest. Contributions could address the role of different health organizations, as the different Red crosses, the combat against diseases or the way wounded were treated, for example. The role of civilians should also be examined. Were they an obstacle for military operations, a mass of people to be subjected and (re) moved, or were they actors in the conflict? Can the history of foreign intervention be rewritten? Do new sources authorise a reinterpretation of the internationalist commitments? A history of practices? Local interactions? The question of memory of the civil war (and its history) will be part of our work. How was the history of this war constructed and how is it presented in museums and monuments? Both in its immediate aftermath and several decades later. The organizers of the conference will take care of accommodation and meals of the participants for the duration of the event. Please let it be known if you need a partial or a total funding of your transport cost. The budget, which is limited for the event, cannot permit a generalised coverage of the expenses.